The Eddie Bauer Ladies Packable Wind Jacket Style EB501 is available in Ladies Sizes XS-4XL. It can be purchased in your choice of the following colors: Adriatic Blue, Black, Black Cherry, Brilliant Blue, Grey Steel and Pear. 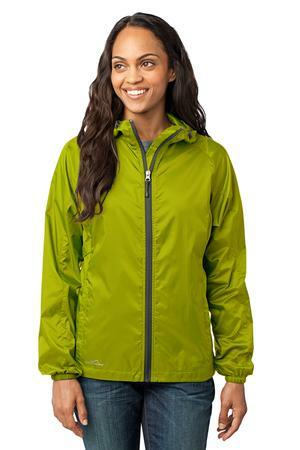 This Ladies Packable Wind Jacket packs down into a pocket, making it easy to carry wherever you go. It features a hood with drawcord and toggles for adjustability, contrast reverse coil zipper, underarm vents, front zippered pockets with packable right pocket, elastic cuffs and an open hem. It includes a contrast Eddie Bauer logo on hem and is made of 100% nylon. Be the first to review “Eddie Bauer – Ladies Packable Wind Jacket Style EB501” Click here to cancel reply.